Before the long Easter weekend, the office was in somewhat of a party mode with lots of people already off and the rest looking forward to a long weekend. 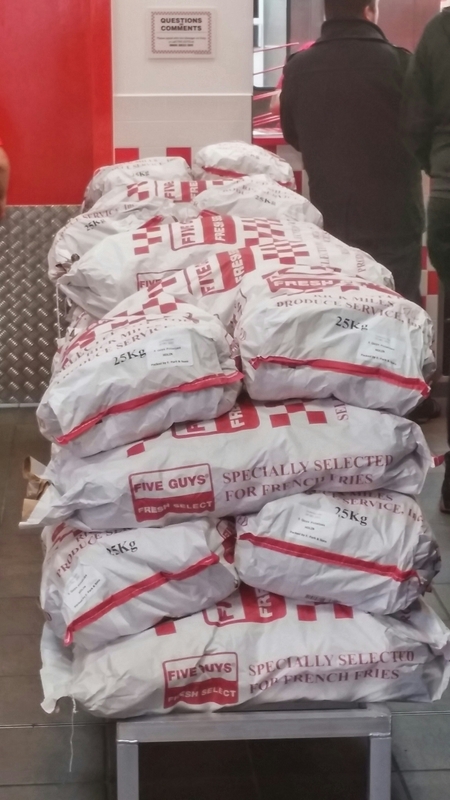 As a result, a few of us decided to go out for lunch with the consensus being to give the new kid on the block, in the form of Five Guys, a go. 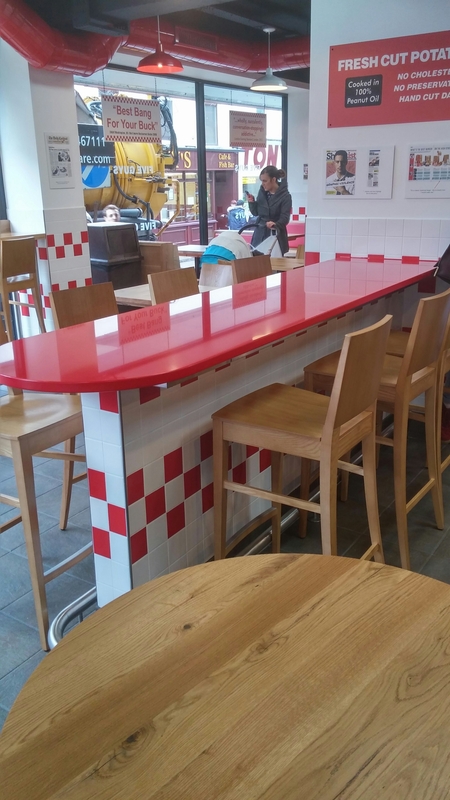 None of us had been to a Five Guys’ outlet before and I had heard mixed reports (ranging from best burger ever, to disappointingly mediocre and holey moley, how much) on their newly opened place in Cardiff. 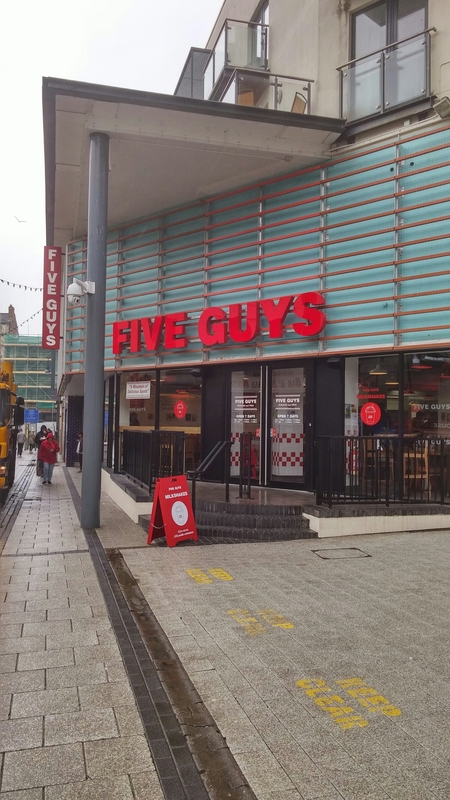 I was interested (with all the Five Guys hype in the local press – Walesonline almost wetting themselves in term of their gushing review) to see how it compared to my current favourite Cardiff burger joint, Got Beef. Located in the Brewery Quarter (what is this fascination with cities and calling bits “quarters” – I am waiting for someone with enough balls to name an area the “Mostly boarded up shops , bookies and charity shops” Quarter), Five Guys also sits on Cardiff’s Caroline street (affectionately known as Chippie alley – as it is full of fast food outlets which cater for the late night munchies crowd). Inside it is a cut above your standard fast food outlet and works on an order and wait model. Not quite Mcdonalds, Burger King etc. as you pay and then pick up elsewhere. More like the system at Argos. Moves the queue along I suppose in terms of ordering, but creates a log jam at the pick up point. We sensibly found a table and waited – others not so sensibly stood. Notwithstanding their distinct red and white livery the place still has what I regard as quite a ultiltarian interior, but there is a bit more to it than the average fast food joint with a few quirky features like piled up sacks of spuds. Rather oddly they seem proud these are sourced from the Netherlands. My reaction on seeing this was why? 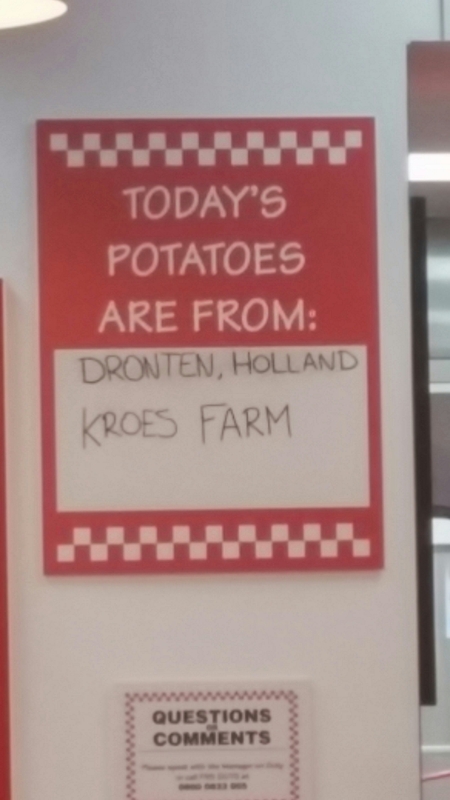 We grow spud here in the UK, why not use them rather than having to ship them in from the Continent? There are lots of exposed, brightly coloured ducting etc. on display, as well as lots of “how much people love us” stuff. To me this is a place to go for a quick bite (it is called fast food after all) rather than to linger. It was very loud and busy on my visit – music blared out and there was a constant shouting of order numbers. This all grated a bit and made for a far from relaxing environment for an old misery like me. 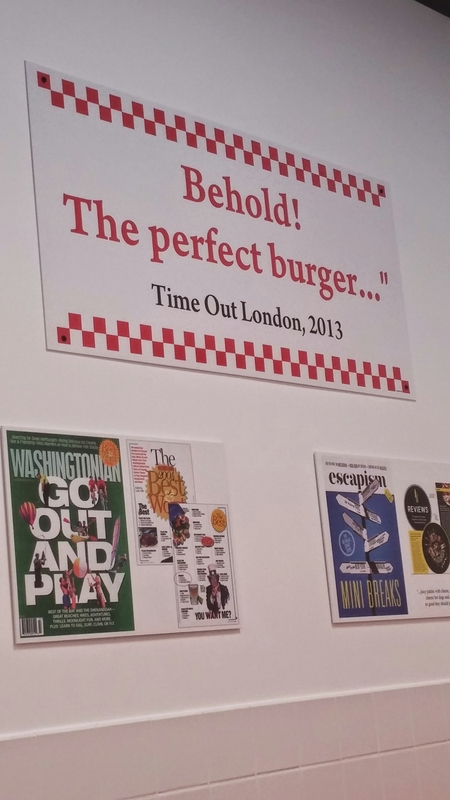 Five Guys menu comprises burger, dogs and sandwiches (including a cursory nod to veggies), as well as fries (standard or Cajun). 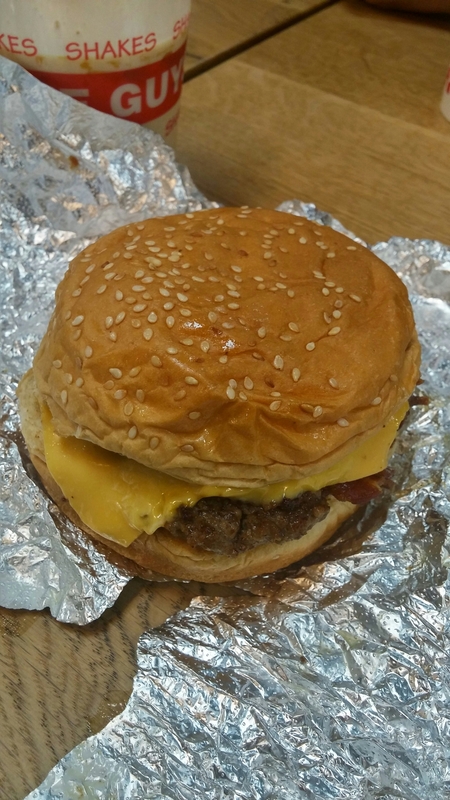 The standard burger (very US this) is a double patty, with the single patty version described as “small”. 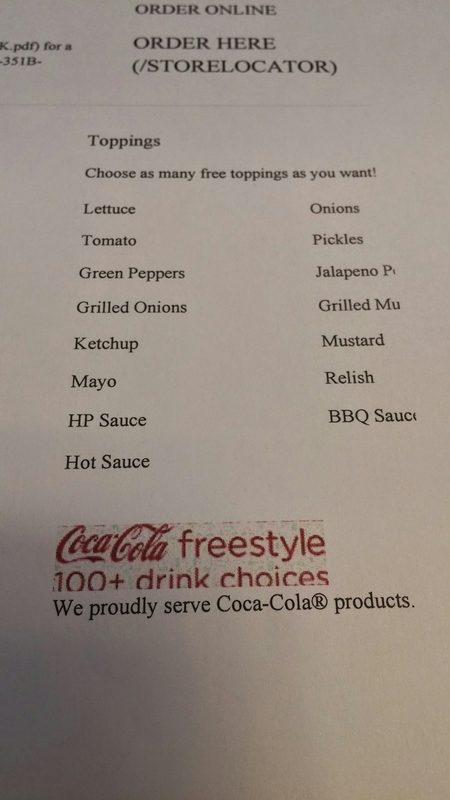 Whilst there are only 4 burgers (if you discount the “little” versions as different, 8 if you don’t) and 4 dogs, they pride themselves on the myriad of options available in the form of free toppings to pimp up your basic burger. 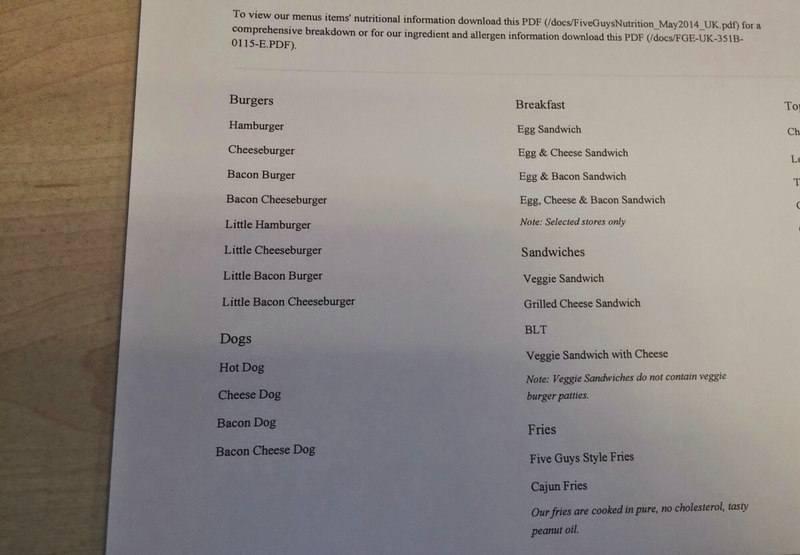 This apparently allows for over 250,000 different possible orders across the range of burgers, dogs and sandwiches. To me this is slightly overstating the position as many of these options are usually standard in a burger. 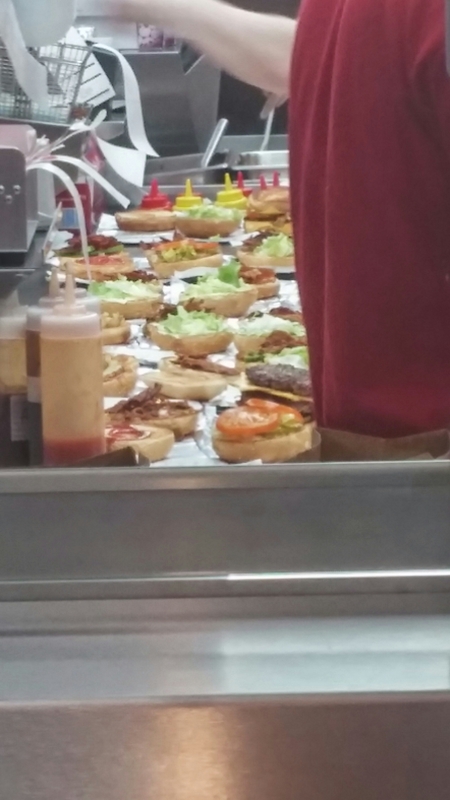 Whilst sceptical about the 250,000 options, I do like the fact that you can dispense easily (i.e not have to actually ask for it to be removed) unnecessary foliage often found in burgers. I can live with lettuce (boring as it usually is) in a burger, but find tomatoes a totally unnecessary and unwelcome addition. My friend, Rachel, on the other hand hates pickles in her burgers (foolish woman). 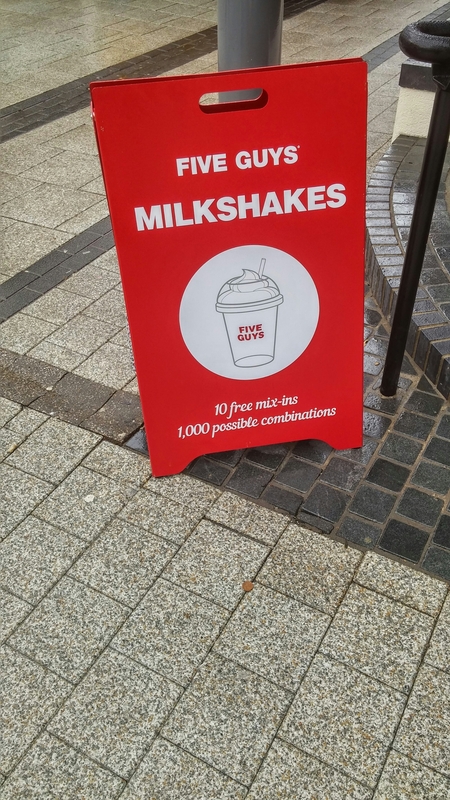 I went for the small (rather than double patty) bacon and cheese burger (£6.75 ) as I wanted a milkshake and deemed a double patty burger and shake + fries too much for lunch. To this basic burger, I asked to be added mustard, mayo and pickles (love proper pickles in my burger). I like my burgers relatively unfussy, but you can load up with every single “extra”, to create what I would regard as an abomination of a burger, should you so wish. Those who go light on extras (like me) seemingly subsidise those who load up their burgers. 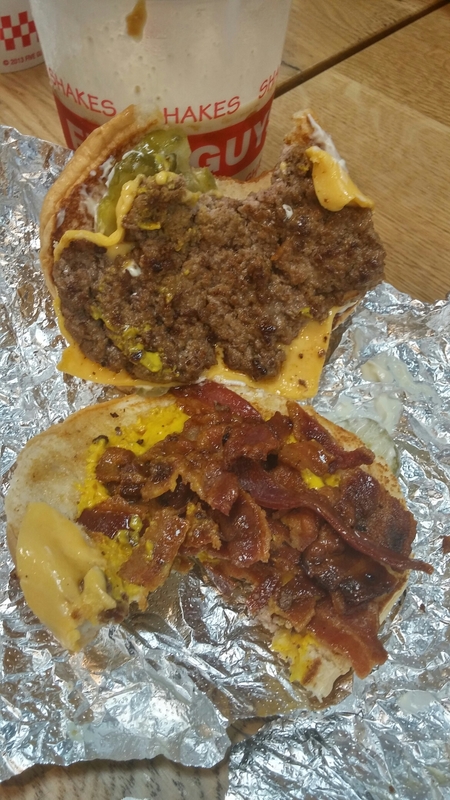 There was no question asked as to doneness of the burger (I know it is a fast food place but that would make the available options go past the million I suspect and for a nicer burger – so missing a trick here Five Guys) and it came resolutely grey with no hint of pink. Not my preference re a burger’s doneness. The burger itself was, for the price, surprisingly dinky in size. The patty, whilst clearly not machine made, was thin and cooked very well done. My actual patty was smaller than others who had the small burger, which suggests portion control issues. This will be sorted as they bed down processes I am sure. Flavour wise the predominate taste was of salt and processed cheese and I hardly got anything from the meat itself. 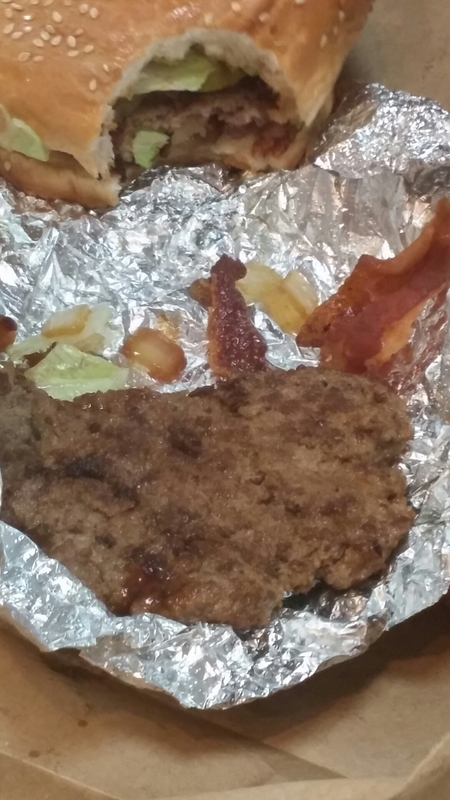 The patties themselves, on all of our burgers, were bland, grey and a bit dried out. Not my kind of burger at all. The bacon was on the very, very crispy side (nuked) and again lacked flavour bar from salt. 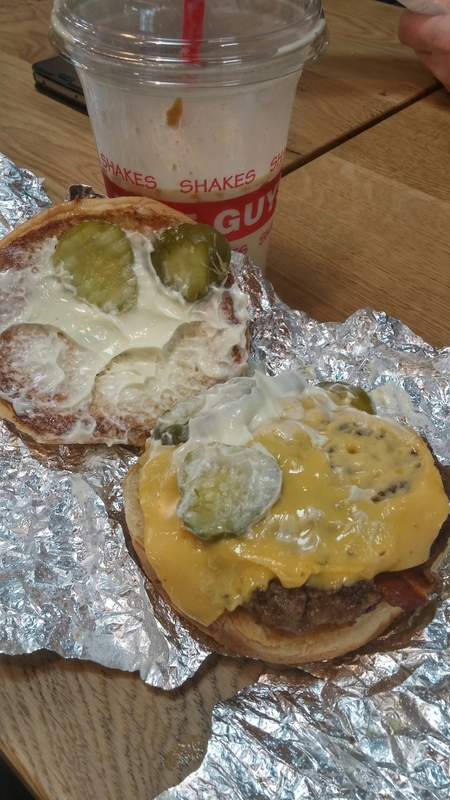 Of the extras, I asked for on my burger, there was way too much mayo and no discernable mustard flavour. Pickles were nice though. I thought it was not much better than a McDonalds (of whom I am not a fan) and way, way too pricey (£6.75) for what I got. On the price front a double patty burger was £2 more than the little single patty burger. Logically this means only £2 of my little bacon cheese burger was the beef patty. That leaved me paying £4.75 for a pretty bog standard bun, a slice of processed cheese, nuked bacon, pickles, mayo and mustard. That seems an awful lot to me. The margins here must be eyewateringly high. 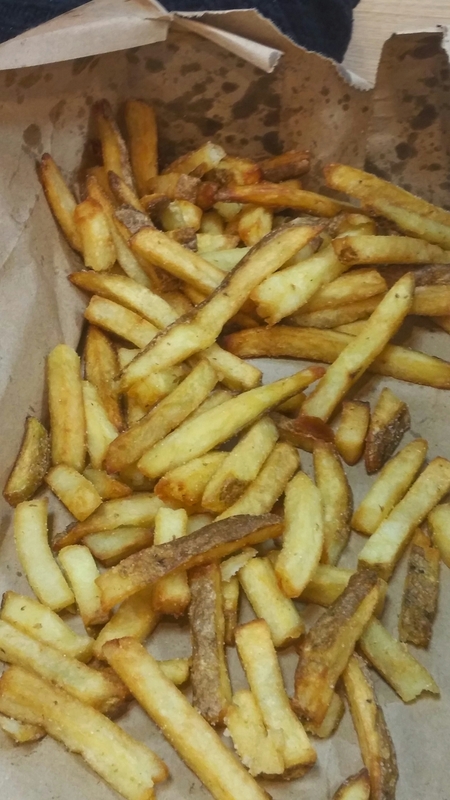 I also ordered small fries (£2.75) which were ok, if again wildly over seasoned. I love salt, but blimey these were more a case of salt with a pinch of fries. Whilst £2.75 for a small portion of fries seems a lot, the portion size was more than generous. I would, however, have preferred less for a lower price. This (from my friend Rachel making me get her a refill after I had to drink much of her drink to slake my thirst. 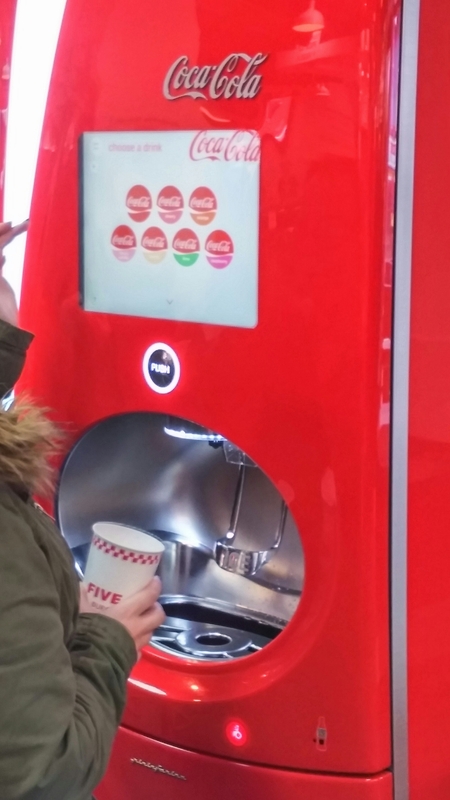 I told her off for being boring as with 100 + options she goes for the sweetened brown water aka diet coke) was easy to use (even for a technophobe like me) and, when you take into account the cup size and fact you can have as many refills as you like, was good value for the £2.50 price. 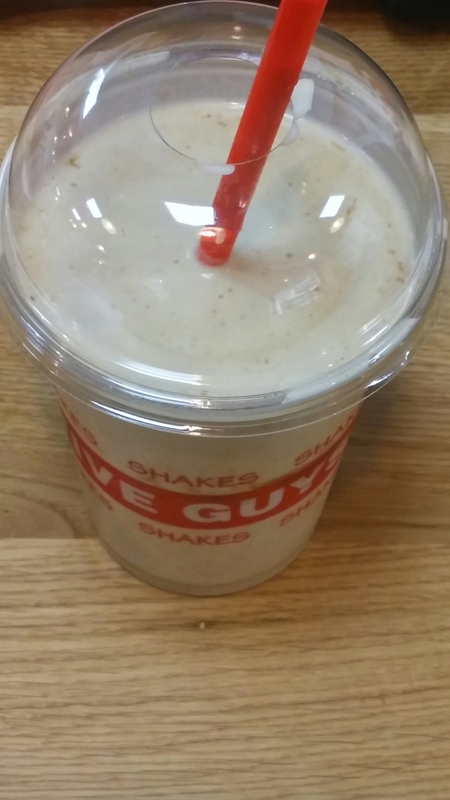 I went for a milkshake (£4.75) which, as with the burger, you can mix up the flavours. I added peanut butter and salted caramel to the basic shake. This was by far the best bit of the meal, with it being a proper thick shake with plenty of peanut and caramel flavour. 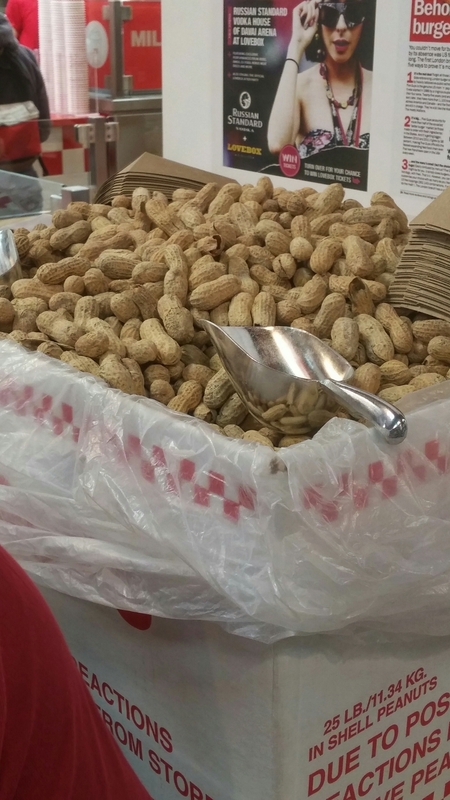 The choice of further salt, in the form of peanut butter and salted caramel – my fault – was a mistake as it added to the overly salty food and gave me a raging thirst all afternoon. Whilst pricey at £4.75 this was a good shake and OK value compared to other places (similar ones at Atomic Burger in Bristol are £4.25). They do have booze available with a selection of bottled beers – including Brooklyn lager. Hard shakes would be a nice idea. Have to say it could get “interesting” in there at 23.15 on a Friday/Saturday night in Cardiff, with booze being sold. I was quite disappointed with my burger. The hype suggested something special, but what I got was average at best on quality. Not good enough by a long chalk for the pretty exorbitant prices they are charging. My meal came in at a whopping £14.25. If you substitute the shake for a soft drink, the cost of the meal here was about the same (or more) as meals I have had at Got Beef, Honest Burger and MEAT Market, all of which were infinitely better. Certainly don’t get the hype surrounding this place and it is way down my list of burger places in Cardiff (and one of the most expensive to boot) let alone elsewhere. Perhaps I am missing something, but I was not the only one in our group who was less than impressed. Got Beef, Urban Tap House, The Grazing Shed etc – you have little to worry about from these guys in my opinion. Is it worth the money – nope. What it certainly was , was underwhelming. Would I go back? No – far too pricey for what was, at best, an average burger. On the plus side, I did like their milkshakes and the drinks machine is quite good. Orders can be placed online for pick up. Brutally brilliant review! Heard a lot about this place and thought it would be a great addition to the Cardiff food scene but this review shows it is below or high standard!! Loved the description of the bacon very funny !! Was all a bit disappointing especially for the high price – but was very busy so must have zomething. Whatever it is it certainly passed me by though. Agree are far better options on the burger front in Cardiff than this place. Great review and has completely put me off going to a fairly new one in Cabot Circus that has taken over the site that Cafe Rouge had. Will give it a miss especially after loving Honest Burger in London so much. 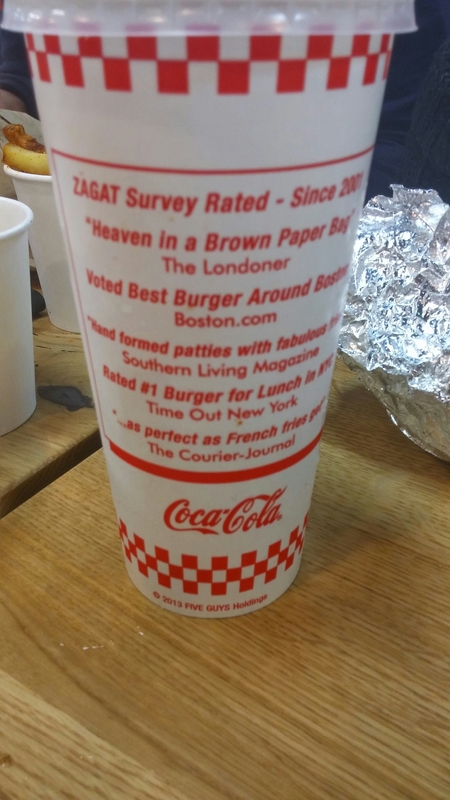 This entry was posted on Apr 5, 2015 by solicitingflavours in American food, Bacon, Burger, burgers, Cardiff, Drink, Fast food, Five Guys, Food, Food and wine products, hot dogs, lunch, lunchtime, New restaurant Cardiff, Non alcoholic drink, Restaurant Review, Sandwich, Take away, Wales.